Players dreamed of stained glass for the construction of more beautiful buildings until quite recently. Developers listened to requests and added this feature to Minecraft 1.2, but what about fences? Surely you would like to get not only a wooden but also an iron fence that is perfectly combined with your construction. 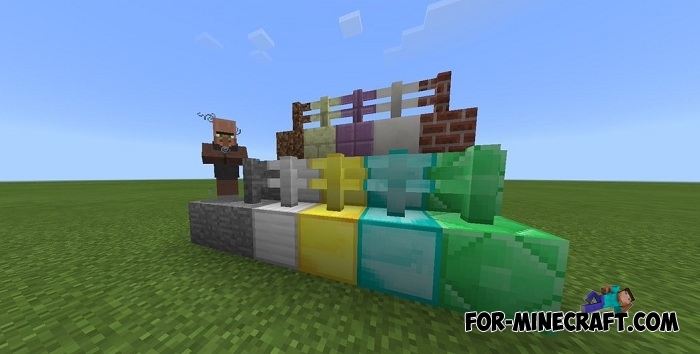 Now you can use watermelon, pumpkin, sand, redstone, bookshelf and sandstone fences. To make builder life easier, the More Fences addon adds 15 new fence types to MCPE. They perform the same function as the original fences made of wood and stone. Firstly, the fence protects the approaches to the house and does not allow other creatures to jump over it. Secondly, the fences look harmonious with any construction from small huts to large castles and settlements. New fences do not differ from stone ones except for appearance. The form also remained the same, the creator only changed the texture and in the end you see beautiful fences for the most fastidious players. How to install the More Fences addon? 1. Download the addon and unzip. 2. Start the game and activate the behavior and resource pack in the game settings. Builder Pro (420+ creations) (Minecraft PE)Using Builder PRO you can create amazing structures on your map with just one click..